In this article I’ll show you how to use Google Alerts for lead (targeted visitors) generation and how it can be used to keep a eye on the competition. In very simple terms a Google alert will inform you every time one of your chosen keywords or keyword phrases appears on the internet. For example if my keyword phrase was “sucking up free traffic” Google would alert me and tell me about this very article that you’re reading right now. How can a Google Alert help you get traffic? Once you have set up all your relevant keywords / keyword phrases Google will update you every time it finds fresh new content based on those words. It tells you the title and short description and the location that caused the alert, with this information you have the opportunity to visit the website that caused the alert and hopefully respond, react, reply, or otherwise interact with the site and leave and link back to your own website. Using this simple methods attract high quality visitors but can also help increase your websites search engines rankings. Every time you use this method you’re creating a back link to your site from another related site. Links from related sites are worth 10x the links from unrelated sites. What you need to do, step by step? 1) You’ll need a Gmail/Googlemail email account, if you don’t have one please create one. 2) Goto Gmail and log into your email account. 3) At the top of the Gmail page select More from the menu, and then select Even More from the drop down menu. A new window will open. 4) Select Alerts from the new page that just opened, it’s about half way down the page. 5) You can now setup your first alert. Search Query: In the search query box enter your keyword phrase, three/four or more word combinations will provide the best results. For example “sucking up free traffic” will provide better results than “free traffic” because the second search term is quite general and will provide lots of less targeted results. You can test with various search types in the same way you do Google searches i.e sucking up free traffic would be a broad match, “sucking up free traffic” would be a phrase match and [sucking up free traffic] would be a exact match. Test the different types of search to find the ones that produce the best results for your particular search. Result Type: I would select everything initially and maybe select something more specific at a later date. You can edit all the alerts from the manage alerts page. How Often: I normally select daily but I’ll check on the alerts once or twice a week, its really personal preference on this option. How Many: I select best results and this normally gives a good return but some internet site update may be missed. Test both options and see what results you get. Deliver To: You just need to select your Gmail email address here. Click Create Alert once you have entered all the options. 6) Create more alerts to cover a good amount of your keyword phrases, about 10-20 alerts should provide a good amount of returns without getting bombarded with too much information. With all your alerts setup Google will now search the internet and email you whenever it finds something new related to your alert keywords. When you first setup your alerts you may notice some duplicate alerts and also some alerts that link back to your own website. Its quite normal in the first week or two. This is a great example of how using Google alerts can help with generating traffic and increase search engine ranks but also customer satisfaction. I received a alert about a company I do some work for, a customers parcel appeared to have gone missing. The customer asked a question about the companies service and delivery time on Yahoo answers, and I was able to answer the customers question and provide a link back to the company website. Getting alerts for your keyword phrase that have been entered onto Yahoo Answers is great, and you can respond to these questions in a helpful manner and look like a hero. This creates goodwill and will get traffic visiting your website. You’ll receive alerts for lots of different types of sites, and you might not be able to interact with every single but in this web 2.0 age most websites will have some way for you to reply, leave a comment e.t.c. The best or most action-able sites will be Q&A sites like Yahoo Answers, Blogs, Forums and social media sites. You must ensure that when you interact with these websites you leave a useful, creative, constructive comment on the topic. Do Not drop a link to your website in the comment box and leave, you must provide some value to the reader. A link on its own provides nothing! Okay, a recap on this free traffic method. Login to Gmail and setup up alerts for you main keyword phrases. 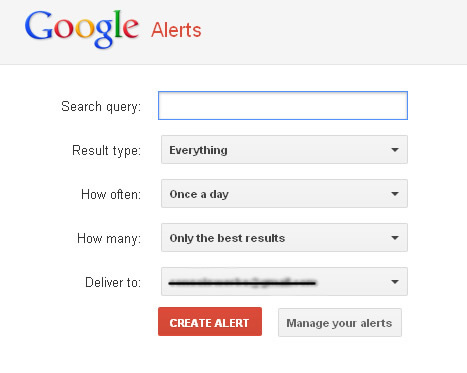 Wait for Google to send the alerts to your email inbox. Check over each alert and visit the websites and try to respond to the issue that caused the alert. Leave a useful comment on the website and include a link back to your website. Repeat this process once or twice a week and you’ll notice a improvement in your organic traffic. I hope you enjoyed reading this article and you put it to use on your own websites. As always I’d love to hear your comments, thoughts or questions about Google alerts and you can leave them for me in the comments box below. I’ll read and answer them all! P.S My post on using Yahoo Answers for traffic generation is a great compliment to this article. I come across your site on sucking up free traffic using google alerts, I found your article very well written and put in a way to understand, I will be setting my google alerts up today, I have like your site on facebook and look forward to reading your other articles, thank you. Read a lot about alerts but never thought to use it so thanks for this info. I have now signed up to alerts and have already received the first set of alerts from Google. Lets hope this gives my traffic a boost. Thanks for the advice.I have noticed a little bit of increased traffic since i started using your tips.